The most crucial game of the last round was a loss of NSH (6-3) in Jakarta on Friday night. Hosts were rolled over by Stapac (9-1) 75-50. Stapac outrebounded NSH 49-25 including a 37-17 advantage in defensive rebounds. It was a great evening for American guard Kendal Yancy (190-94, college: Texas) who led his team to a victory scoring 12 points, 7 rebounds and 4 assists. International Kaleb Gemilang (183-91) helped adding 17 points. American power forward Anthony Simpson (202-87, college: Kent St.) responded with 15 points and 8 rebounds. The winner was already known earlier in the game, so both coaches allowed to play the bench players saving starting five for next games. Stapac have an impressive series of five victories in a row. They maintain first place with 9-1 record which they share with defeated NSH. NSH at the other side still keeps top position with three games lost. Stapac's supporters look forward to an exciting derby game next round, where their team will face at home their local rival from Jakarta Satria Muda. Important game to mention about took place in Jakarta. Fifth ranked Prawira (3-5) saved a 2-point derby victory on the road edging second-ranked Satria Muda (4-3) 79-77 on Friday evening. It was an exceptional evening for American Dalarian Williams (198, college: Life) who led the winners with a double-double by scoring 22 points and 13 rebounds. Brachon Griffin accounted for 21 points and 12 assists. American forward Dior Lowhorn (201-87, college: USF) came up with a double-double by scoring 24 points and 17 rebounds for Satria Muda in the defeat. Satria Muda's coach tried various players' combinations and tested in total twelve players in this game, but that didn't help. Prawira moved-up to third place, which they share with Bima Perkasa and Pacific Caesar. Defending champion Satria Muda keeps the second position with three games lost. They share it with Pelita Jaya. Prawira will have a break next round, and it should allow them to practice more before next game. Satria Muda will play on the road against the league's leader Stapac in Jakarta and it may be a tough game between close rivals. Very important is a home loss of second ranked Pelita Jaya (4-3) against fifth ranked Siliwangi (3-6) on Friday night. Host Pelita Jaya was defeated by Siliwangi in a tough game in Jakarta 58-67. It ended at the same time the two-game winning streak of Pelita Jaya. The best player for the winners was Michael Vigilance who had a double-double by scoring 20 points and 23 rebounds. Wayne Bradford produced 17 points, 6 rebounds and 6 assists for the hosts. Pelita Jaya's coach let to play ten players, but that didn't help to avoid defeat in this game. Siliwangi moved-up to fourth place. Loser Pelita Jaya keeps the second position with three games lost. They share it with Satria Muda. Siliwangi will have a break next round, and it should allow them to practice more before next game. Pelita Jaya will play against Bima Perkasa in Sakti and hope to secure a win. The game between Top Four teams took place in Pandang. Third ranked host Hang Tuah (5-4) defeated 4th placed Satya Wacana (2-7) 100-96. Americans were the main players on the court. Jarad Scott orchestrated the victory with a double-double by scoring 34 points (!!!) and 14 rebounds. Satya Wacana's coach Efri Meldi gave the chance to play for ten players, but that didn't help to avoid defeat in this game. Hang Tuah moved-up to second place. Satya Wacana lost their seventh game in a row. They dropped to the fifth position with seven games lost. Hang Tuah will have a break next round. Satya Wacana will play at home against the league's leader NSH (#1) and hope to win that game. The most crucial game of the last round was a loss of NSH (6-3) in Jakarta on Friday night. Hosts were rolled over by Stapac (9-1) 75-50. Stapac outrebounded NSH 49-25 including a 37-17 advantage in defensive rebounds. It was a great evening for American guard Kendal Yancy (190-94, college: Texas) who led his team to a victory scoring 12 points, 7 rebounds and 4 assists. International Kaleb Gemilang (183-91) helped adding 17 points. American power forward Anthony Simpson (202-87, college: Kent St.) responded with 15 points and 8 rebounds and the other American import guard Dashaun Wiggins (188-91, college: Portland St.) scored 8 points and 5 steals. The winner was already known earlier in the game, so both coaches allowed to play the bench players saving starting five for next games. Stapac have an impressive series of five victories in a row. They maintain first place with 9-1 record which they share with defeated NSH. NSH at the other side still keeps top position with three games lost. Stapac's supporters look forward to an exciting derby game next round, where their team will face at home their local rival from Jakarta Satria Muda. Important game to mention about took place in Jakarta. Fifth ranked Prawira (3-5) saved a 2-point derby victory on the road edging second-ranked Satria Muda (4-3) 79-77 on Friday evening. Prawira forced 27 Satria Muda turnovers. Strangely Satria Muda outrebounded Prawira 48-29 including a 36-21 advantage in defensive rebounds. Their players were unselfish on offense dishing 22 assists. It was an exceptional evening for American Dalarian Williams (198, college: Life) who led the winners with a double-double by scoring 22 points and 13 rebounds. His fellow American import guard Brachon Griffin (185-92, college: Elizabeth City, agency: SDJ Sports) accounted for 21 points and 12 assists for the winning side. Four Prawira players scored in double figures. American forward Dior Lowhorn (201-87, college: USF) came up with a double-double by scoring 24 points and 17 rebounds and international forward Jamarr Johnson (193-88, college: Widener) added 14 points, 7 rebounds and 4 assists respectively for Satria Muda in the defeat. Satria Muda's coach tried various players' combinations and tested in total twelve players in this game, but that didn't help. Prawira moved-up to third place, which they share with Bima Perkasa and Pacific Caesar. Defending champion Satria Muda keeps the second position with three games lost. They share it with Pelita Jaya. Prawira will have a break next round, and it should allow them to practice more before next game. Satria Muda will play on the road against the league's leader Stapac in Jakarta and it may be a tough game between close rivals. The game between Top Four teams took place in Pandang. Third ranked host Hang Tuah (5-4) defeated 4th placed Satya Wacana (2-7) 100-96. Strangely Satya Wacana outrebounded Hang Tuah 62-40 including a 22-9 advantage in offensive rebounds. Their players were unselfish on offense dishing 25 assists. Hang Tuah brought some defensive toughness making 10 blocks. Americans were the main players on the court. Forward Jarad Scott (203-95, college: Union, TN) orchestrated the victory with a double-double by scoring 34 points (!!!) and 14 rebounds. Guard Gary Jacobs (188-92, college: Cent.Washington) contributed with a double-double by scoring 19 points, 16 rebounds, 8 assists and 6 blocks for the winners. Scott is a former Eurobasket Summer League player, which is considered top international summer league in the market. Five Hang Tuah players scored in double figures. Forward Raymond Miller (204-88, college: CS Fullerton) answered with a double-double by scoring 29 points, 27 rebounds and 5 blocks and guard Madarious Gibbs (185-93, college: Texas Southern) added 30 points, 9 rebounds and 11 assists in the effort for Satya Wacana. Satya Wacana's coach Efri Meldi gave the chance to play for ten players, but that didn't help to avoid defeat in this game. Hang Tuah moved-up to second place. Satya Wacana lost their seventh game in a row. They dropped to the fifth position with seven games lost. Hang Tuah will have a break next round. Satya Wacana will play at home against the league's leader NSH (#1) and hope to win that game. Very important is a home loss of second ranked Pelita Jaya (4-3) against fifth ranked Siliwangi (3-6) on Friday night. Host Pelita Jaya was defeated by Siliwangi in a tough game in Jakarta 58-67. It ended at the same time the two-game winning streak of Pelita Jaya. The best player for the winners was American forward Michael Vigilance (203-94, college: Clark Atlanta) who had a double-double by scoring 20 points and 23 rebounds. 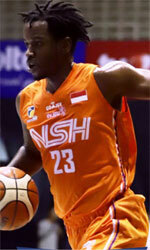 His fellow American import point guard Martavious Irving (186-90, college: Kansas St.) chipped in 17 points. Vigilance is a former Eurobasket Summer League player, which is considered top international summer league in the market. American guard Wayne Bradford (193-92, college: Davenport) produced 17 points, 6 rebounds and 6 assists and international forward Kore White (205-89, college: S.Florida) added 21 points and 7 rebounds respectively for the hosts. Pelita Jaya's coach let to play ten players, but that didn't help to avoid defeat in this game. Siliwangi moved-up to fourth place. Loser Pelita Jaya keeps the second position with three games lost. They share it with Satria Muda. Siliwangi will have a break next round, and it should allow them to practice more before next game. Pelita Jaya will play against Bima Perkasa in Sakti and hope to secure a win.